I work a lot with 3D calculations, and every so often a non trivial 3D tidbit comes along. Some of these might be of use to others – and so, by the power vested in me as absolute monarch of this blog, I hereby extend its scope to some light 3D geometry. I’ll try to keep posts in this category less rigorous and yet more verbose than regular math write-ups. The triple product in the denominator, A∙(B×C), should look familiar: that is in fact det(M) – the determinant of the original matrix. Had we inverted M with a more traditional apparatus, say Kramer’s rule, we would have divided by this determinant directly. All the denominators are in fact equal, to each other and to det(M). First, for the fun of it. Personally I find it much easier to understand – and thus remember – geometric stories than algebraic ones. Second, this formulation exposes several optimization opportunities. After computing B×C you can obtain the first of (and so all of) the denominators, by simply taking a dot product with A. If you need just a single row of the inverse matrix, you can calculate it directly – without having to invert the entire matrix. Third, using analytical expressions as above for solving linear equations is generally preferable to numeric solvers. For matrices as small as 3×3, solving numerically would probably be a bad idea anyway – even traditional, tedious inverses (with adjoint matrices and all) would be preferable to numeric solutions. BTW, higher dimensional analogues do exist – and are as easy to derive – but the main added value, namely direct geometric insight, is lost beyond three dimensions. This entry was posted in 3D Geometry, Algorithms. Bookmark the permalink. @Anon: thanks. From my own measurements I never saw noticeable performance improvements when implementing *3d vector* operations (dot, cross, etc) with SSE, but I’ll be happy to listen if you measured otherwise. Stay tuned, more of this stuff coming up. Why does A*(BxC) = det(M)? Then how does A*(BxC) yield the volume? The geometric explanation is that BxC is not only orthogonal to B & C, it also has length equal to the area of the BxC parallelogram. 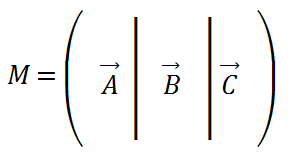 Thus, A dot that vector gives the projection of A to the normal to B-C plane (i.e., the ‘height’ of the slanted box) times the area of the base – i.e., the volume. The algebric explanation is that BxC can be written (and is commonly defined as) a determinant of a matrix with unit vectors i, j, k at row 1, and B&C at rows 2&3. Taking a dot product of A with a vector (any vector) represented by i, j &k components amounts to replacing the i, j &k symbols with A’s coordinates (jot such a dot product down on a piece of paper and you’d see it immediately). Substituting A’s coordinated into i, j & k in the matrix defining BxC gives exactly the matrix M : A at the row 1 (where i-j-k were), B&C at rows 2&3. Thus, A*(BxC) is algebraically identical to det(M). can you please provide geometric representation using diagram having coordinate system and how matrix and inverse look in this coordinate system. The claim is that row 3 of the inverse is orthogonal to columns 1 & 2 of the matrix. A graphic representation would show one vector perpendicular to two others, something like this: https://ofekshilon.com/ortb/. Illustrating this for all 3 rows would just be visually cumbersome.